Launch Parties for Oasis Styling Service - We're All Invited! Back in October I told you about a brilliant opportunity offered by Oasis and Ireland AM, who teamed up to search for four budding fashion stylists. After going head-to-head on Ireland AM for six weeks, the winners have landed personal styling jobs in four Oasis stores: Stephen’s Green in Dublin, Dundrum Town Centre, Patrick Street in Cork, and Donegal Place in Belfast. These outlets will provide a new in-store styling service offering advice, personal consultations and one-to-one customer service. And best of all, it's completely free! 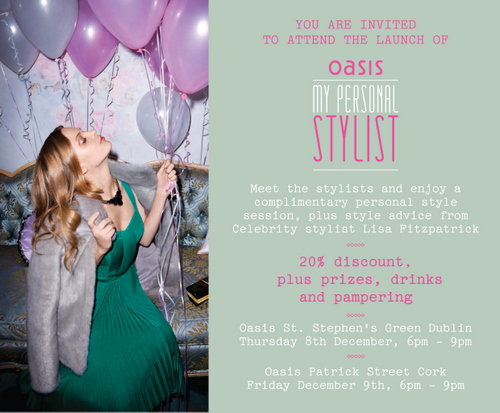 To launch the new personal styling service, and to celebrate the achievements of the new stylists, Oasis are hosting a glitzy launch party in Dublin tonight (St. Stephen’s Green) and in Cork tomorrow, at the Patrick Street store. Both events take place between 6 and 9pm with a host of celebrity guests, along with 20% discounts, live music, complimentary drinks and snacks and free hair and makeup stations. If you pop along you’ll also be in with a chance to win limited edition Oasis Christmas Collection pieces, and vouchers for up to €250. Make sure you book your free personal style session while you’re there: the stylists are available for one-to-one consultations to help you sort out any wardrobe worries -- perfect timing for the party season! In-store events like this can be great craic; I thoroughly enjoyed the ones I recently attended in Karen Millen and Fitzpatricks Shoes. Will you be dropping in to enjoy the hospitality? Still have my Xmas party dress to buy so I think I will check this out tonight, thanks for the info!! enter to win my MAC giveaway One day left!!! We got the best catering New York service for our fashion party. Everyone had a blast! FLUFF AND FRIPPERIES WINS BEST IRISH BEAUTY/FASHION BLOG IN BLOG AWARDS IRELAND 2012!! !